Smart thermostat manufacturers love to tout their energy-savings capabilities – but you’ve got a role to play, too. If you just installed a shiny new Nest, Honeywell Wi-Fi, or ecobee3, here are six things you should do to get big savings out of your new smart thermostat. Set your schedule: Smart thermostats aim to learn your schedule, but you can help it out by setting your schedule via its interface or web app. Over the next week or so, you and your new thermostat will work together to create the right program for your home. Go low: Smart thermostats steer you towards energy efficient temperatures, but you can save even more money by finding ways to keep yourself warm while the house stays cooler. Bundle up and use a space heater if you’ll just be in one room all day – and enjoy the savings. Adjust your temperature: When you’re not following your typical weekly schedule, remember to adjust your temperature accordingly via the companion app. Use the companion app and web portal: The app is an extension of your thermostat! Use it to lower the temp when you step out for a few hours of errands or coming home later than your usual schedule. Set up vacations: Use the vacation feature on smart thermostats to easily lower the heat while you’re away. (Be careful – if frozen pipes are a risk in your area, keep your “away” temperature around 55 degrees). Get competitive: Look at the monthly reports, if available. Earn “Leafs” with your Nest or peruse reports from your Ecobee to see how you did. Try to beat your previous month – and other users in your region! Still shopping around? 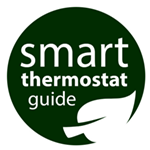 View our smart thermostat comparison guide.